The Lord clearly explains here that this is the substance of all revealed scriptures. And one should understand this as it is given by the Supreme Personality of Godhead. Thus one will become intelligent and perfect in transcendental knowledge. In other words, by understanding this philosophy of the Supreme Personality of Godhead and engaging in His transcendental service, everyone can become freed from all contaminations of the modes of material nature. Devotional service is a process of spiritual understanding. Wherever devotional service exists, the material contamination cannot coexist. 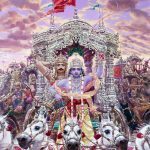 Devotional service to the Lord and the Lord Himself are one and the same because they are spiritual; devotional service takes place within the internal energy of the Supreme Lord. The Lord is said to be the sun, and ignorance is called darkness. Where the sun is present, there is no question of darkness. Therefore, whenever devotional service is present under the proper guidance of a bona fide spiritual master, there is no question of ignorance. Everyone must take to this consciousness of Krishna and engage in devotional service to become intelligent and purified. Unless one comes to this position of understanding Krishna and engages in devotional service, however intelligent he may be in the estimation of some common man, he is not perfectly intelligent. The word anagha, by which Arjuna is addressed, is significant. Anagha, “O sinless one,” means that unless one is free from all sinful reactions it is very difficult to understand Krishna. One has to become free from all contamination, all sinful activities; then he can understand. But devotional service is so pure and potent that once one is engaged in devotional service he automatically comes to the stage of sinlessness. While one is performing devotional service in the association of pure devotees in full Krishna consciousness, there are certain things which require to be vanquished altogether. The most important thing one has to surmount is weakness of the heart. The first falldown is caused by the desire to lord it over material nature. Thus one gives up the transcendental loving service of the Supreme Lord. The second weakness of the heart is that as one increases the propensity to lord it over material nature, he becomes attached to matter and the possession of matter. The problems of material existence are due to these weaknesses of the heart. In this chapter the first five verses describe the process of freeing oneself from these weaknesses of heart, and the rest of the chapter, from the sixth verse through the end, discusses purushottama-yoga. This verse concludes this chapter. In these twenty verses (iti), I have thus spoken completely a most secret scripture. The classes of matter and consciousness have been revealed by the servant. Thus the supreme position of Krsna has been explained in this chapter. 15.20 This guhyatamam, most secret, i.e. most mystical;- what is that?-sastram, scripture-. 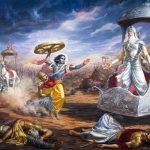 Although the Gita as a whole is spoken of as the scripture, still this chapter itself is here referred to as such, and this for eulogy as is evident from the context. 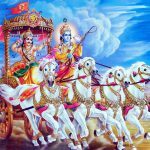 For, not only has the entire meaning of the scripture Gita been stated here in brief, but the whole purport of the Vedas also has been comprehended here. And it has been said, ‘He who realizes it is a knower of the Vedas’ (1), ‘I alone am the object to be known through all the Vedas’ (15). (Thus, this most secret scripture) iti uktam, has thus been uttered; maya, by Me; anagha, O sinless one. O scion of the Bharata dynasty, buddhva, under-standing; etat, this, the scripture which has the purport as has been revealed; syat, one becomes; buddhiman, wise; and krta-krtyah, has his duties fulfilled; but not otherwise. 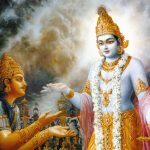 The meaning is that what-ever a Brahmana has to do as a consequence of his special birth (as a Brahmana), all that becomes accomplished when the reality of the Lord is known. The idea is that nobody’s duties become fulfilled in any other way. And it has been said, ‘O son of Prtha, all actions in their totality culminate in Knowledge’ (4.33). There is also a saying from Manu: ‘This, verily, is the fulfilment of a Brahmana in particular. For, by getting this, a twice-born has his duties fulfilled; not otherwise’ (Ma. Sm. 12.93). Since you have heard from Me this truth about the supreme Reality, therefore, O scion of the Bharata dynasty, you have achieved your Goal! 15.20 Iti etc. The most secret [scripture] : Because it explains the oneness of all. One becomes a man of wisdom by knowing this only and not by the knowledge of worldly affairs. One becomes a man of success by just understanding this, and not even by the deeds like the total victory over the foes, earning wealth, enjoying women and so on. The word ca ‘also’ indicates a wonder. Has it not been witnessed that [always] one becomes a man of success by what has been accomplished ? But it is strange that [in the present case one becomes a man of success] by just what has been realised. The word iti ‘thus’ indicates the conclusion of the treatise. For, what is to be taught has come to an end completely. 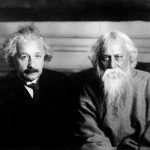 That is why in the Sixteenth Chapter the eligibility of the pupil, Arjuna, is exclusively dealt with; and nothing new is taught. The intention [of that chapter] is to say only this much : ‘The divine wealth is just of that nature; but the devilish wealth born of illusion is of this nature; you (Arjuna) are however endowed with the divine wealth of wisdom’. Hence [the Lord] is going to say ‘Don’t worry. [You are endowed] with the divine wealth’ (XVI, 5). That is why earlier in the context of explaining the clash between the wisdom and ignorance this has been indicated [by me (Ag. )]: ‘It is the confrontation between the wisdom and ignorance that has been detailed under the pretext of [describing] the wars between the gods and devils.’ So, while dealing essentially with the quality of a pupil, other subjects are mentioned incidentally. So also the pair of chapters (Ch. XVII & XVIII) would follow. But the teaching [proper] has come to an end completely here itself. For what is to be achieved is nothing but serving (attaining) the Absolute Lord-the serving, which is of the nature of total absorption into Him by one’s entire being. All other things are only to achieve this end. This has been explained earlier. The Supreme Happiness is indeed nothing but a complete absorption into the Supreme Lord by one’s entire being. iti — thus; guhya-tamam — the most conﬁdential; śāstram — revealed scripture; idam — this; uktam — disclosed; mayā — by Me; anagha — O sinless one; etat — this; buddhvā — understanding; buddhi-mān — intelligent; syāt — one becomes; kṛta-kṛtyaḥ — the most perfect in his endeavors; ca — and; bhārata — O son of Bharata.